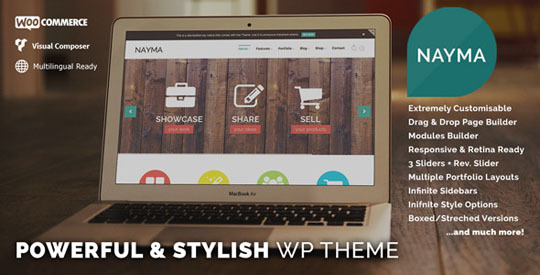 NAYMA is a stylish, multi-purpose and responsive WordPress theme suited for many, many different types of websites. Project showcasing, Shopping sites, Business websites, you name it. It was developed along WordPress best practices, with great attention to details to make your work easier than ever! With lots of options, an extremely flexible framework and still highly intuitive. Scroll down to see what’s inside. 360+ icons from the great FontAwesome! 70+ Background Patterns for you to choose in every section! Contact Form 7 plugin integration. Already styled for NAYMA! Demo Content + 1 click install!